Water marketing is the transfer or sale of water or water rights from one user to another, typically from an agricultural to an urban water agency, often without investing in new infrastructure. 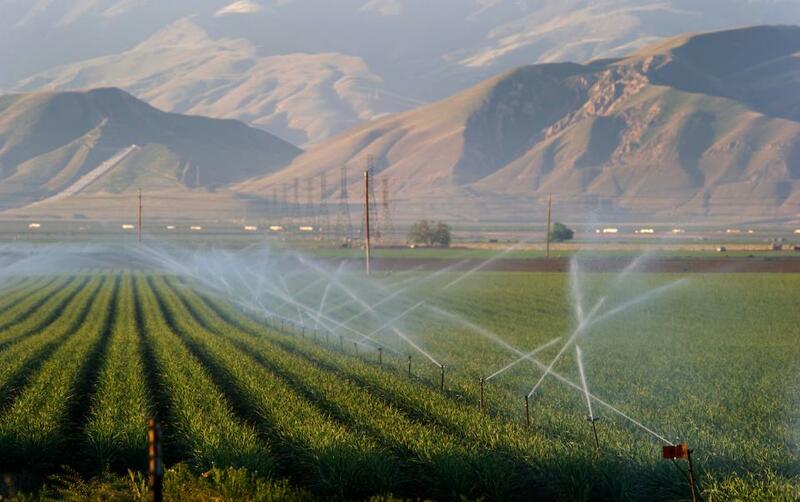 Groundwater helped make Kern County the king of California agricultural production, with a $7 billion annual array of crops that help feed the nation. That success has come at a price, however. Decades of unchecked groundwater pumping in the county and elsewhere across the state have left some aquifers severely depleted. Now, the county’s water managers have less than a year left to devise a plan that manages and protects groundwater for the long term, yet ensures that Kern County’s economy can continue to thrive, even with less water. South Coast agencies purchased more than 27,000 acre-feet of supplemental water during four drought years to make up for lowered allocations from Lake Cachuma and the State Water Project, and for most of those deals, payback includes water in addition to money. Agencies’ so-called “water debt” means that when the city of Santa Barbara purchased from the Mojave Water Agency last year, for example, it was committing to paying back 1 acre-foot of water for every 4 acre-feet it purchased. State Sen. Richard Roth, D-Riverside and Assemblywoman Laura Friedman, D-Glendale last week introduced SB 307, which seeks to ensure “that any future water transfers from groundwater basins underlying desert lands do not adversely affect the California desert’s natural or cultural resources,” according to a bill fact sheet. Ominous predictions about the desert lake’s ecological collapse are beginning to occur. You can see this sea up close during our Lower Colorado River Tour, Feb. 27-March 1, when we will visit the fragile ecosystem and hear from several stakeholders working to address challenges facing the sea. In a recent paper, Stephanie Pincetl, director of the California Center for Sustainable Communities at UCLA, and co-authors argue that investments made over the years to fortify the city’s supply with additional imported water have not solved LA’s water shortages. … The paper asserts that LA could become water self-reliant by strategically investing in local supplies, and offers several concrete strategies for improving LA’s water security. As a lobbyist and lawyer, David Bernhardt fought for years on behalf of a group of California farmers to weaken Endangered Species Act protections for a finger-size fish, the delta smelt, to gain access to irrigation water. As a top official since 2017 at the Interior Department, Mr. Bernhardt has been finishing the job: He is working to strip away the rules the farmers had hired him to oppose. Agricultural and environmental leaders spoke at the Water Market Exchange Symposium in the Satellite Student Union on Jan. 24 to share their perspectives on a water market exchange program. The symposium featured speakers from water agencies, environmental interests, disadvantaged community interests and water market administrators. California’s Imperial Irrigation District will get the last word on the seven-state Colorado River Drought Contingency Plans. And IID could end up with $200 million to restore the badly polluted and fast-drying Salton Sea. Thursday, as the clock ticked toward a midnight deadline set by a top federal official, all eyes had been on Arizona. 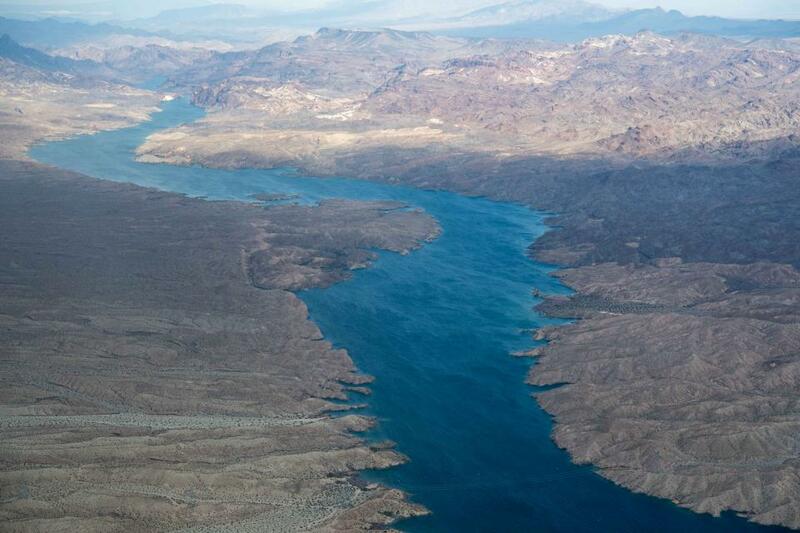 But lawmakers there approved the Colorado River drought deal with about seven hours to spare. IID, an often-overlooked southeastern California agricultural water district, appears to have thrown a last-minute monkey wrench into the process. The Colorado River Indian Tribes, or CRIT, have lands that stretch along 56 miles of the lower Colorado River. The tribe’s right to divert nearly 720,000 acre-feet from the river is more than twice the water that is allocated to the state of Nevada. By law, that water is to be used on the reservation. But if CRIT convinces Congress to allow off-reservation leasing, the change would free up a large volume of water that would be highly desirable for cities and industries. Terms were revealed this week for a developing water sales agreement between the Montecito Water District and City of Santa Barbara. The 50-year water sales agreement provides 1,430 acre-feet of water a year to Montecito, at a cost of about $2,700 per acre-foot. The terms of agreement allow for the possibility to purchase and receive 445 acre-feet of additional water each year. Angelenos bearing gifts have elicited skepticism in Owens Valley since the early 1900s, when city agents posed as ranchers and farmers to buy land and water rights and then built dams and diversions that turned much of the region into an acrid dust bowl. Now, the Los Angeles Department of Water and Power is extending an olive branch. The department has proposed selling some of the commercial property it leases … to dozens of lessees in the financially struggling towns along a rustic, 112-mile stretch of Highway 395 between the eastern Sierra Nevada range and the White-Inyo Mountains. Members of the Colorado River Indian Tribes will vote Saturday, Jan. 19 on a proposed ordinance to allow for the lease of a portion of the Tribes’ Colorado River water allocation to outside interests. The issue of leasing Tribal water rights has become a contentious issue among Tribal members. Opponents claim this compromises the Tribes’ resources, while supporters point to the economic benefits. Far less settled is how Newsom will fill his administration’s most important positions regarding state water policy. One of Newsom’s key tests confronts him immediate: State Water Resources Control Board Chair Felicia Marcus’ term expires this week. It has been called speculative, foolhardy and overly expensive, but Aaron Million’s plan to pump water from the Utah-Wyoming border to Colorado’s Front Range just won’t dry up. Now seeking water rights from the Green River in Utah for a new version of his plan, Million thinks he has fashioned a winning proposal to feed Colorado’s thirsty, growing population. Montgomery is known for fostering collaborative relationships among stakeholders and as a leader in protecting and restoring water quality within California and throughout the Southwest and the Pacific Islands. He is currently serving as the Assistant Director of the Water Division in the US Environmental Protection Agency (Region 9). Prompted by the collapse of fish populations, the State Water Resources Control Board is trying to prevent humans from totally drying up these rivers each year. The regulators’ lodestar for how much water the rivers need is the amount of water a Chinook salmon needs to migrate. A new report shows environmental water transactions are happening more and more in the U.S., particularly short-term deals that allow irrigators to conserve or forgo water use for short periods of time. Use it or lose it. 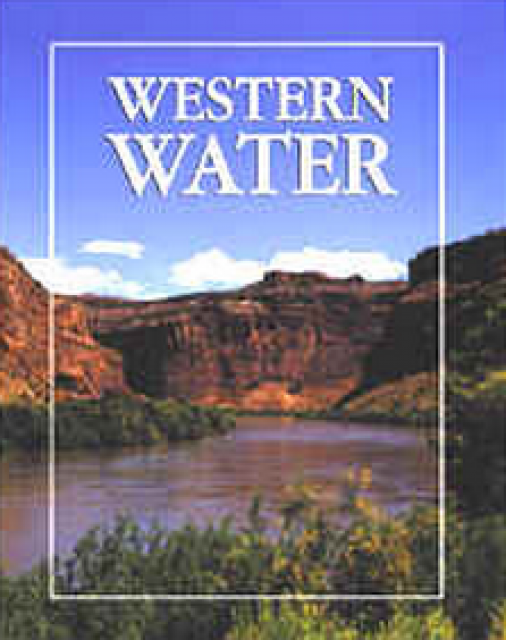 Historically, that was the prevailing understanding amongst water rights holders throughout the Western United States. Congressional leaders reached a short-term spending deal Wednesday that effectively punts most of the contentious funding decisions into the new year. That includes the question of whether to extend a federal law designed to deliver more Northern California water south, which has become a factor in the Delta water-sharing agreement reached earlier this month. California wildlife officials have concluded an environmental review of the controversial Cadiz water pumping project is severely flawed, and cannot be used to approve a key stream and lakebed alteration permit. The California Dept. of Fish and Wildlife says scientists for Cadiz and the Orange County-based Rancho Santa Margarita Water District wrongly claimed that a spring vital to bighorn sheep is not connected to the aquifer from which the project would draw water. In the universe of California water, Tim Quinn is a professor emeritus. Quinn has seen — and been a key player in — a lot of major California water issues since he began his water career 40 years ago as a young economist with the Rand Corporation, then later as deputy general manager with the Metropolitan Water District of Southern California, and finally as executive director of the Association of California Water Agencies. In December, the 66-year-old will retire from ACWA. As the Colorado River Basin becomes drier and shortage conditions loom, one great variable remains: How much of the river’s water belongs to Native American tribes? Native Americans already use water from the Colorado River and its tributaries for a variety of purposes, including leasing it to non-Indian users. But some tribes aren’t using their full federal Indian reserved water right and others have water rights claims that have yet to be resolved. Combined, tribes have rights to more water than some states in the Colorado River Basin. Thursday’s Top of the Scroll: Cadiz Inc. wants to sell groundwater from the Mojave Desert. Will California let it happen? The next two days could help determine the fate of a proposal by Cadiz Inc. to pump groundwater in the Mojave Desert and sell it to Southern California cities. 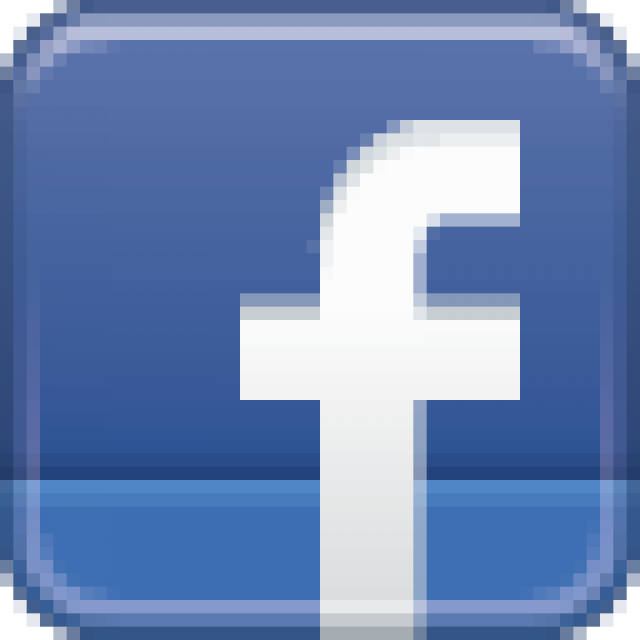 … The state Assembly approved the measure in a 45-20 vote Wednesday evening. But the bill could face an uphill battle in the Senate, and the legislative session ends Friday night. A judge denied a request Thursday by a federal water management agency for more time to evaluate the environmental impacts of California’s water transfer program that allows some water rights holders to sell water to parched farms in the southern part of the state. Clear water gushes from a hole in the ground, forming Bonanza Spring, the largest spring in the southeastern Mojave Desert. This rare oasis is at the center of the fight over a company’s plan to pump groundwater and sell it to California cities. Cadiz Inc. is proposing to pump an average of 16.3 billion gallons of water each year for 50 years. A company’s controversial plan to sell groundwater from the Mojave Desert ran into new opposition as a Southern California water district voted against the proposal. The board of the Upper San Gabriel Valley Municipal Water District decided not to approve a nonbinding letter of intent to purchase water from the Cadiz Inc.’s proposed project. Followers of the ecologically dubious and largely pointless Cadiz water project in the Mojave Desert might have pricked up their ears last week at reports of a possible conflict of interest involving Jared Kushner, President Trump’s son-in-law, and the investment firm Apollo Global Management. After extensive fieldwork, site observation and geologic mapping, a team of scientists hired by Cadiz Inc. concluded that a proposed water transfer project in a remote part of San Bernadino County desert won’t harm one of the largest wildlife water sources in the Mojave Desert. Farmers, ecologists, water managers, even those tasked with fighting backcountry wildfires could greatly benefit from knowing months in advance how much water will be available from melting mountain snow every spring. For decades predicting snowpack accumulation has been largely unreliable, based solely on historical data and capricious El Nino weather patterns. The Salton Sea is about to start shrinking more rapidly. A 2003 water transfer deal called for the Imperial Irrigation District to deliver “mitigation water” to the lake for 15 years. With those water deliveries ending in the final days of 2017, the lake’s decline will begin to accelerate. In a mere seven weeks, hundreds of thousands of California residents will face a major deadline affecting the health of their families and their communities. On Dec. 31, water deliveries that have been staving off ecological disaster at the Salton Sea for 15 years will come to a halt, leaving an uncertain future for the entire region. Environmental groups are suing the Trump administration over its decision supporting a company’s plan to pump up to 16.3 billion gallons of groundwater each year from a Mojave Desert aquifer and build a pipeline to sell that water to Southern California cities. Environmental activists sued Tuesday to halt a plan to pump water from beneath the Mojave Desert and sell it to Southern California cities and counties. The lawsuit takes aim at the U.S. Bureau of Land Management for allowing Cadiz Inc. to build a 43-mile pipeline to transfer the water from its desert wells into the Colorado River Aqueduct so it can be sold to water districts. Fresh from gaining the long-sought federal approval for its massive desert water project, Scott Slater, Cadiz president and CEO, said it’s time for the project to “slow down” a bit. … The Cadiz project involves pumping billions of gallons of water annually from an underground aquifer in a remote part of the Mojave Desert in San Bernardino County. In an about-face, the federal government has given Cadiz Inc. the go-ahead to lay a pipeline for its proposed desert water project in an existing railroad right-of-way. New obstacle in Cadiz water project? The company says no. The state of California is asserting landownership rights along a proposed pipeline’s path that would help carry groundwater from a remote part of the Mojave Desert in San Bernardino County to Orange County and other communities. A state commission is throwing a new hurdle in front of Cadiz Inc.’s plans to turn a remote desert valley into a lucrative water source for Southern California. In a Sept. 20 letter to Cadiz, the State Lands Commission informed the company that its proposed water pipeline crosses a strip of state-owned land and therefore requires a state lease. In California’s long-raging water wars, pitting north against south and farmer against city dweller, the one thing everybody agreed on Wednesday was that the outdated method of shipping water throughout the most populous state needs a serious upgrade. 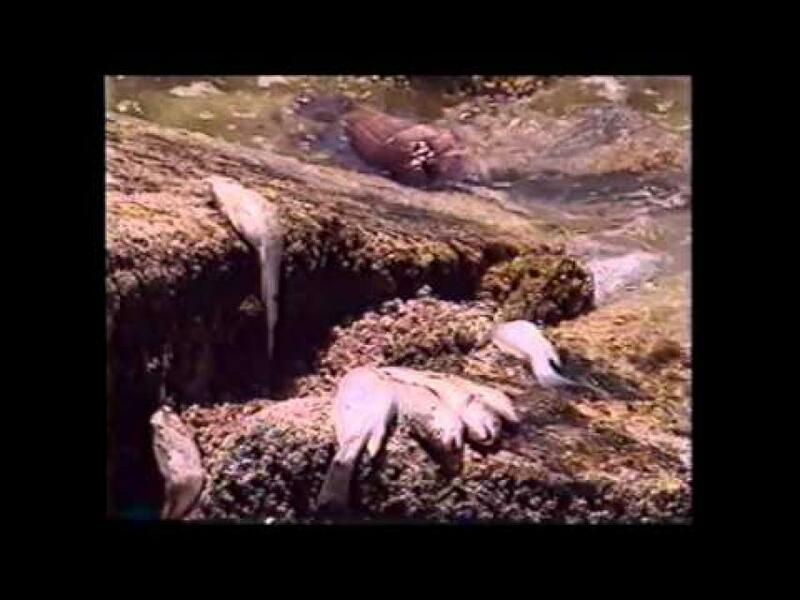 Will anti-water pumping legislation be brought back from the dead? Late last week, we suggested watching this space for possible revival of Assembly Bill 1000, legislation to halt a controversial water-pumping project in the Mojave Desert that’s being pushed by the politically connected firm Cadiz, Inc. Pop star Sia is doing more than promoting music with her Twitter account. The “Chandelier” singer is voicing her opinion on an important issue in Southern California: the Cadiz water project. A bill designed to block the transfer of groundwater from the remote San Bernardino County desert died in Sacramento on Friday after failing to advance beyond the Senate appropriations committee. A proposed 2015 sale of Arizona water to California that never happened is now a flash point in a controversy pitting Arizona’s top water agency against the Central Arizona Project. The Los Angeles Department of Water and Power is opposing a company’s proposal to pump groundwater in the Mojave Desert and sell it to Southern California cities. There was no electricity when Vickie Buchanan’s family came to Diamond Valley in 1958. Nor were there many crops. But there was water, and as early settlers, Vickie’s parents were given priority access under a rule fundamental to Western water law: “first in time, first in right.” A steady flow of farmers followed, planting alfalfa and timothy hay grass in the high-desert soil of the central Nevada valley. A company’s vision to pump water from the Mojave Desert and sell it to thirsty Southern California cities had looked to some to be a long shot. … But a series of developments has invigorated backers of the project, which involves both federal and state jurisdictions. The Trump administration has shown support for the project, which has been opposed by [U.S. Senator Dianne] Feinstein and several environmental groups that argue the water extraction would harm the fragile desert ecosystem. In the end, it wasn’t very controversial. Nineteen years after San Joaquin County water interests overwhelmingly rejected a water-sharing plan with rival East Bay Municipal Utility District, a similar plan earned the unanimous approval of the Board of Supervisors on Tuesday. Wednesday’s Top of the Scroll: Will a federal policy change help this company sell Mojave Desert groundwater? A long-running political struggle over a company’s plan to sell water from a Mojave Desert aquifer has taken a new turn with the Trump administration announcing a policy change that could facilitate the controversial water project. In another U-turn from existing environmental policy, the Trump administration has eased the way for a controversial California desert water project that President Obama’s team had blocked. The Trump administration has handed a big boost to a private water venture in Southern California, angering California’s senior senator, Democrat Dianne Feinstein, who said the decision could “destroy pristine public land” in the Mojave Desert. Until Donald Trump won the presidency, prospects looked bleak for Cadiz, a California company that has struggled for years to secure federal permits to transform Mojave Desert groundwater into liquid gold. With the change of administration, a new day is dawning. The project, which involves the U.S. Fish and Wildlife Service and the Imperial Irrigation District, is one of several initial efforts underway to restore habitat and reduce windblown dust as the Salton Sea shrinks. The lake is about to begin receding rapidly. The Yuba County Water Agency board of directors on Tuesday unanimously voted to reject an initiative to redistribute revenue generated from groundwater substitution transfers — that is the sale of surface water which is then replaced locally by pumped water. 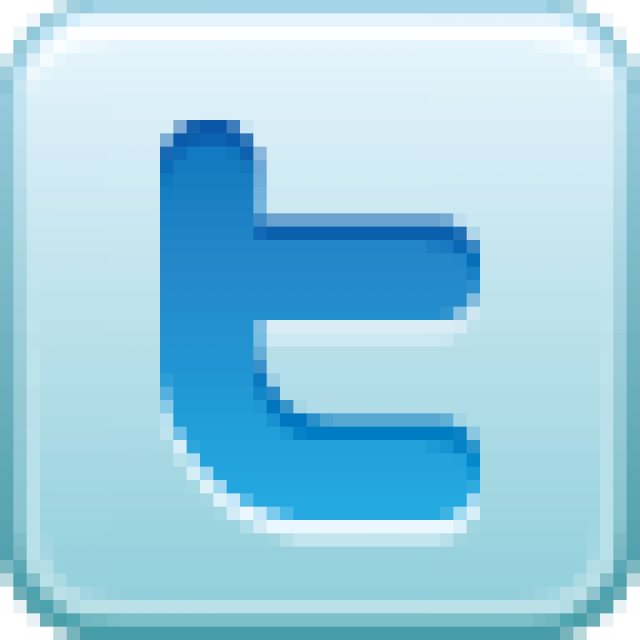 … The initiative, known as the Groundwater Fairness Act, was submitted to the agency on Sept. 30. As plans move forward for a massive desalination plan in Rosarito Beach, a proposed pipeline to carry some of that water to San Diego County is undergoing scrutiny by the U.S. State Department. If whiskey is for drinking and water is for fighting over, five years of drought have transformed California’s civil courts into well-worn legal boxing rings. As climate change threatens the state’s long-term water future, local water officials and legal experts say water rights have morphed into priceless bounty worth protecting by any means necessary. On a 3-2 vote after a lengthy discussion about fears of eroding water rights, irrigation leaders agreed Monday to sell some Stanislaus River water in coming weeks. At a special meeting Monday, irrigation leaders will consider selling more river water to buyers south of the Sacramento-San Joaquin Delta, a tradition that has brought in millions of dollars but also controversy to the Oakdale Irrigation District. California officials don’t have to pay property owners to access their land to conduct preliminary testing before deciding whether to move forward with a $15.7 billion plan to build two giant water tunnels to supply drinking water for cities and irrigation for farmers, the California Supreme Court ruled Thursday. … Officials promoting the tunnels will present plans to state water regulators in hearings starting Tuesday. In a win for the state, the California Supreme Court declared Thursday that the state has the right to go on private property for soil and environmental testing as part of a plan to divert fresh water under or around the Sacramento-San Joaquin Delta on its way to Central and Southern California. The California Supreme Court cleared the way Thursday for state water authorities to do environmental and geological testing on private land for a proposed project to divert Sacramento-San Joaquin Delta water to the south. The time period for legal challenges to the controversial San Bernardino County Mojave Desert underground water transfer plan has passed, officials for Cadiz Inc. said this week. Water leaders voted 3-2 Tuesday to sue to bar elected board members Linda Santos and Gail Altieri from closed-door board discussions regarding an ongoing lawsuit facing the Oakdale Irrigation District. Santos and Altieri cast “no” votes but were outvoted by board members Steve Webb, Gary Osmundson and Herman Doornenbal. A judge reversed course and decided that the Oakdale Irrigation District must address environmental concerns before implementing a new fallowing program. A company’s proposal to pump billions of gallons of water from a Mojave Desert aquifer has survived a legal fight as an appeals court rejected several challenges by opponents of the plan. Cadiz Inc. won a decisive courtroom victory Tuesday for its plans to transfer ancient groundwater in a remote part of San Bernardino County’s Mojave Desert to parts of Orange County and other locations. The ruling by a three-judge panel in Santa Ana moves urban districts a step closer to getting up to 75,000 acre feet of desert groundwater a year from the Cadiz and Fenner valleys in San Bernardino County — enough to supply about 150,000 homes. A judge declined Wednesday to halt the Oakdale Irrigation District’s evolving plan to idle some farmland and sell water not needed for that land. The district has not revealed – to the public or its own board of directors – how its fallowing program has changed, other than to say that previous prospective buyers no longer are involved. The rains this winter were more or less than expected, depending on where you live and what you expected. … The unequal distribution of water continues as state and federal water leaders allocate surface water supply. The Oakdale Irrigation District expects to reap $13.75 million selling Stanislaus River water to buyers from the Fresno area and on the Valley’s drought-scarred West Side, according to a sales agreement unanimously approved Tuesday by the OID board. Only one farmer showed up Tuesday to share thoughts on the irrigation district’s controversial habit of selling river water to outside buyers, although benefits from doing so became the focus of a subsequent budget discussion. At least at the Salton Sea, the district’s [Imperial Irrigation District] hardball tactics seem to be working: There’s been more political progress this year than ever before. Gov. Jerry Brown has asked for a plan of action, and several long-stalled pilot projects are finally getting underway. Irrigation leaders complied with California open-meetings law when they agreed to sell Stanislaus River water to Fresno-area buyers at a Tri-Dam meeting in Manteca, an attorney representing the Oakdale Irrigation District said in a written response to a customer’s formal complaint. Imperial Valley farmers know their water is precious and understand that to preserve a way of life that runs back a century they have to grapple with the needs of a drought-stricken state. … In 2003, the Imperial Irrigation District, under pressure from Senator Dianne Feinstein and other federal and state officials, controversially agreed to sell as much as 280,000 acre-feet a year to San Diego. Irrigation leaders illegally agreed to sell Stanislaus River water to outsiders, an Oakdale Irrigation District customer alleges in a formal complaint. … The district has explained the deal in meetings, a news release and an Oct. 18 advertisement in The Modesto Bee. Irrigation leaders agreed to refund drought surcharges paid by farmers this year, an action that was overshadowed Tuesday by a dispute over a recently unveiled sale of water to outsiders. Irrigation agencies in Oakdale and Manteca will reap $11.5 million selling Stanislaus River water to outsiders in coming weeks. Sensitive to pressure from local farmers, government officials and media, the Oakdale Irrigation District kept the deal under wraps until Tuesday’s announcement. The CEO for embattled Cadiz Inc. has a plan to keep alive a controversial project to transfer ancient groundwater in a remote part of San Bernardino County’s Mojave Desert to parts of Orange County and other locations, where it could serve as many as 400,000 people. Federal land managers have dealt a blow to the controversial Cadiz project that would draw water from ancient aquifers in the Mojave Desert and pipe it to cities across California. In a long-awaited decision, the U.S. Bureau of Land Management says Cadiz cannot use an existing railroad right-of-way for a new water pipeline that would carry supplies from the project’s proposed well field to the Colorado River Aqueduct. Drought-stricken cities in Southern California will soon get some help courtesy of the Southern Nevada Water Authority. … Pending approval from its board, the Metropolitan Water District of Southern California will pay the authority almost $44.4 million for the water, which equates to about a six-month supply for the Las Vegas Valley. Residents in the Coachella Valley are used to the seasonal rotten-egg stench from the Salton Sea, but not for nine days in a row. … In 2017, water to the sea will decrease greatly when an agreement to transfer water from farms to San Diego kicks into high gear. The South Feather Water and Power Agency is seeking to transfer about 12 percent of its stored water to agencies south of the Sacramento-San Joaquin Delta. Last fall, farmers working the flat land along the Colorado River outside Blythe, California, harvested a lucrative crop of oranges, lettuce and alfalfa from fields irrigated with river water. But that wasn’t their only source of income. An air of decline and strange beauty permeates the Salton Sea: The lake is shrinking – and on the verge of getting much smaller as more water goes to coastal cities. The decades-long struggle between two water giants – one serving San Diego County and the other serving most of Southern California – is about to reach a critical milestone. The [East Bay Municipal Utility District] EBMUD board agreed Tuesday to buy up to 12,000 acre feet of water from the Placer County Water Agency this year. Fresno bought nearly 3,000 acre-feet of Millerton Lake water last week for $1 million — a deal so uncommon this year that I [Mark Grossi] had to read reporter George Hostetter’s story twice. In 2000, most of the Sacramento region’s water agencies and environmental groups came together in the historic Water Forum Agreement that established a framework to provide a reliable water supply through 2030 and to preserve environmental resources of the lower American River. Even as they cope with their own cutbacks, several Sacramento Valley water agencies are contemplating major water sales to huge farming interests south of the Delta. … While the dollars are tempting, area officials say water sales are also a means of helping their fellow Californians. An entrepreneur attempting to pioneer the shipment of large volumes of water from an Alaskan town to thirsty global markets claims his company is a step closer after signing a contract to deliver 10 million gallons per month to a buyer in dry California. On Tuesday, the board of the East Bay Municipal Utility District, or EBMUD, unanimously authorized district staff to negotiate the purchase of up to 21,000 acre-feet of Sacramento River water from the Glenn-Colusa Irrigation District, Sycamore Mutual Water Co. and Reclamation District 1004 outside of Colusa. Commentary: Would an open water market improve things? Almonds take too much water. Wait, alfalfa is the bad guy. What about those water hogging geeks in Silicon Valley? No, no, no — that “evil” fracking is to blame. With one emergency water supply already flowing in, the East Bay’s largest water district plans to buy three others to bolster its drought defenses. The East Bay Municipal Utility District board on Tuesday will consider authorizing the purchase of up to 21,000 acre feet of water from three Northern California suppliers with water to spare. SWIIM, which stands for Sustainable Water and Innovative Irrigation Management, seeks to streamline the water transfer process, selling its service to farmers and water districts. Already operating in Colorado, the startup is working with Western Growers, a trade group, to start pilot programs in Kern County, the Sacramento Valley, the Imperial Valley and Coachella Valley this year. The Dublin San Ramon Services District says its path toward buying surplus Yuba County water is clearer after the Tri-Valley’s wholesale water supplier — Alameda County Zone 7 Water agency — withdrew its earlier protest against the transfer. Representatives from Riverside and Imperial counties met in Sacramento Wednesday to urge state water officials to create — and finally fund — a Salton Sea restoration plan before it is too late. California officials said Wednesday that the drought-stricken state set an unachievable bar to save the Salton Sea and outlined small projects aimed at staving off the demise of the state’s largest lake, disappointing farmers, environmentalists and others. After listening to seven hours of doomsday predictions, state water officials agreed Wednesday to look at one of California’s largest but often ignored environmental problems: the deterioration of the Salton Sea. Los Angeles is offering rice farmers in the Sacramento Valley more money than the city has ever paid for water — $700 per acre-foot. At this price, rice farmers could make more money selling water than they can make on their crops. In a sign of this dry time, Sacramento Valley rice growers offered to fallow some of their fields and sell a more valuable harvest: Feather River water. With the drought stretching into its fourth year, a heavyweight water agency from Los Angeles has come calling on Sacramento Valley rice farmers, offering up to $71 million for some of their water. Residents in California are already resigned to another year of drought. 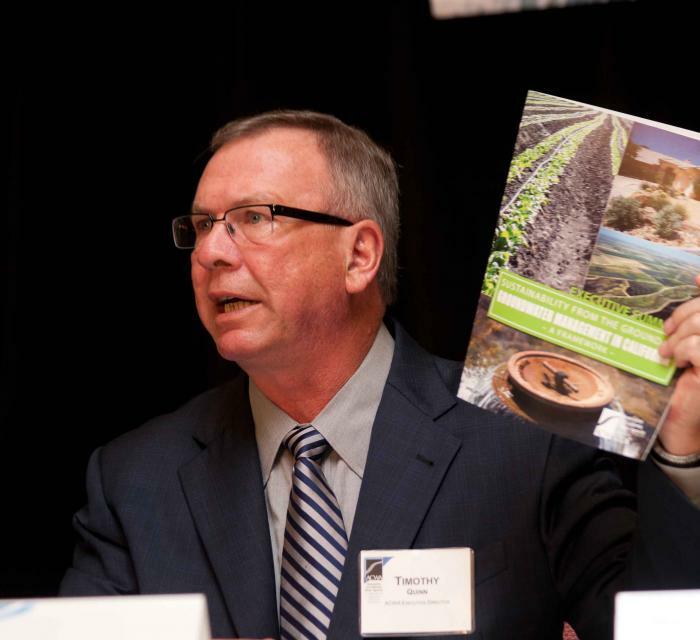 Now the question is whether Northern California landowners will have water to sell. The Dublin San Ramon Services District plans to buy the water from Yuba County to ease its severe shortage — which has resulted in some of the most severe penalties in the Bay Area. During its meeting Tuesday, the Butte County Board of Supervisors will consider sending a letter of concerns to the Biggs-West Gridley Water District over plans to transfer Feather River water to the San Joaquin Valley. Merced County’s proposed groundwater ordinance is one step closer to becoming law. Drought and a legal threat have combined to stall the Oakdale Irrigation District’s controversial idea of selling water to out-of-county buyers. The [Oakdale] irrigation board on Tuesday could begin approving deals with farmers willing to idle their land and sell the water that would have been used there. Imperial County and the Imperial Irrigation District announced a settlement in a long-running legal battle Tuesday, ending 12 years of litigation over a water transfer deal and its effects on the shrinking Salton Sea. The case stems from the 2003 Quantification Settlement Agreement, or QSA, the largest agricultural-to-urban water transfer in U.S. history. The water districts of the Coachella Valley and the Imperial Valley are sharply at odds over an attempt to press the state to come up with a plan for the deteriorating Salton Sea. The Imperial Irrigation District is calling on all stakeholders in the 2003 water transfer deal to come together to finally find a solution to the piece of that puzzle that has remained elusive ever since: the promised restoration of the Salton Sea. The Imperial Irrigation District is pressing for the state to take the lead in settling on a plan for the Salton Sea and paying for it as a deadline nears in less than three years for the lake’s decline to accelerate. Pasture owners around Oakdale willing to go without water will be paid for fallowing their land this year, Oakdale Irrigation District directors decided Tuesday. If I have sugar in my pantry and flour in my cupboard, does that make me a baker? No. But The Bee continues to assert that since the Oakdale Irrigation District pumps groundwater and sells surface water that makes it guilty of pumping and selling groundwater out of the county. First, let me make it clear: OID [Oakdale Irrigation District] does not pump groundwater and then sell it. That is called water mining. It is prohibited in Stanislaus County. Imperial Valley water officials on Tuesday urged the state to help “avert an emerging environmental and public health crisis at the Salton Sea,” or otherwise consider restricting a massive water transfer deal that benefits San Diego. Butte County supervisors are being asked to voice sincere dissatisfaction with an environmental document reviews the potential impacts of a 10-year water transfer program from the U.S. Bureau of Reclamation. Oakdale Irrigation District directors will discuss options for selling water to out-of-county agencies Tuesday morning during a closed-door session. Next week [Tuesday, Oct. 21] the Bureau of Reclamation will be in Chico, asking folks to give feedback on an assessment of water transfers from the Sacramento Valley over 10 years. Drought is rampant these days in many parts of the American West, so consider this a pretty sweet gift: You’ve just been given the rights to some water. … Your job is to turn around and use that resource in the most valuable way possible. This summer, California’s water authority declared that wasting water — hosing a sidewalk, for example — was a crime. Next door, in Nevada, Las Vegas has paid out $200 million over the last decade for homes and businesses to pull out their lawns. One of the most extreme droughts in California’s history has been hitting agriculture hard, forcing cutbacks in water deliveries in parts of the Central Valley and leaving more than 400,000 acres of farmland fallow and dry. State and federal wildlife officials this month are preparing extraordinary measures to protect Chinook salmon returning to spawn in California’s drought-depleted rivers. 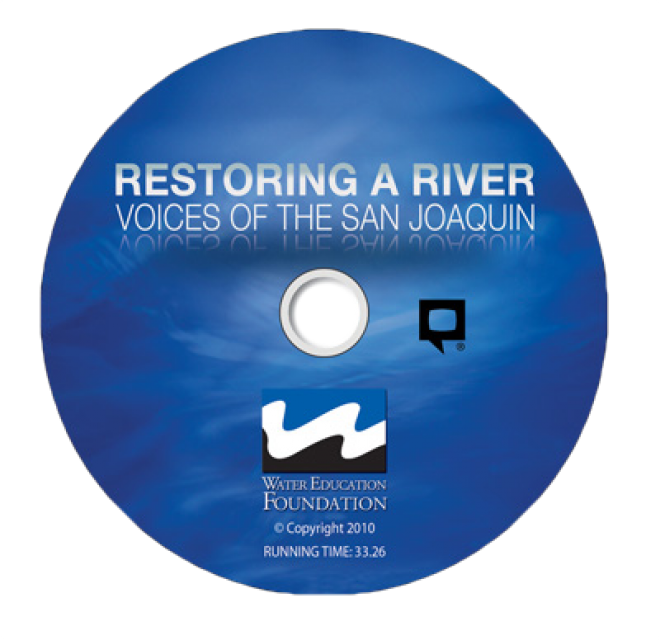 This 30-minute documentary-style DVD on the history and current state of the San Joaquin River Restoration Program includes an overview of the geography and history of the river, historical and current water delivery and uses, the genesis and timeline of the 1988 lawsuit, how the settlement was reached and what was agreed to. 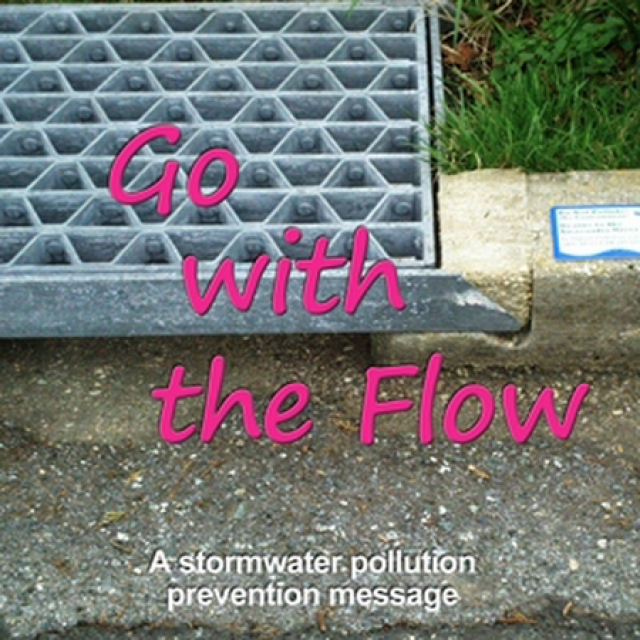 This 7-minute DVD is designed to teach children in grades 5-12 about where storm water goes – and why it is so important to clean up trash, use pesticides and fertilizers wisely, and prevent other chemicals from going down the storm drain. 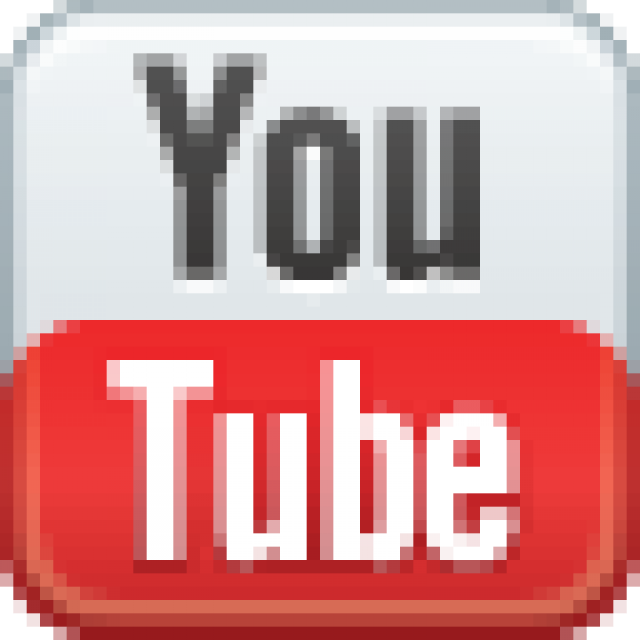 The video’s teenage actors explain the water cycle and the difference between sewer drains and storm drains, how storm drain water is not treated prior to running into a river or other waterway. The teens also offer a list of BMPs – best management practices that homeowners can do to prevent storm water pollution. 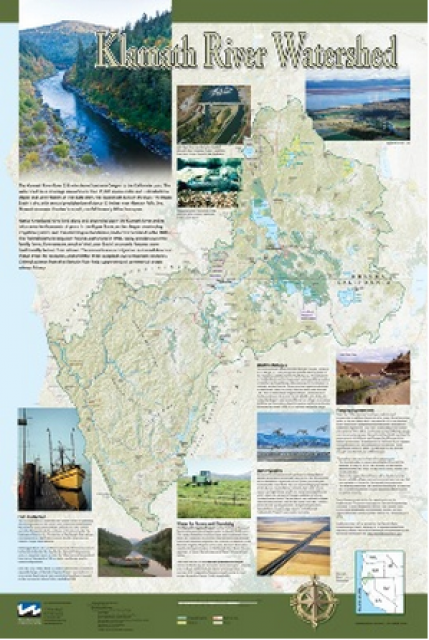 This beautiful 24×36 inch poster, suitable for framing, displays the rivers, lakes and reservoirs, irrigated farmland, urban areas and Indian reservations within the Klamath River Watershed. The map text explains the many issues facing this vast, 15,000-square-mile watershed, including fish restoration; agricultural water use; and wetlands. Also included are descriptions of the separate, but linked, Klamath Basin Restoration Agreement and the Klamath Hydroelectric Agreement, and the next steps associated with those agreements. Development of the map was funded by a grant from the U.S. Fish and Wildlife Service. 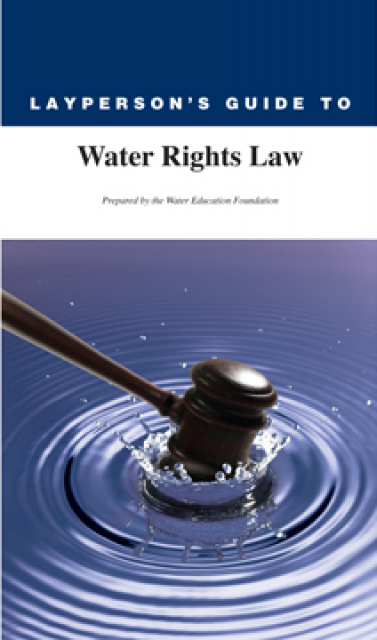 The 28-page Layperson’s Guide to Water Rights Law, recognized as the most thorough explanation of California water rights law available to non-lawyers, traces the authority for water flowing in a stream or reservoir, from a faucet or into an irrigation ditch through the complex web of California water rights. 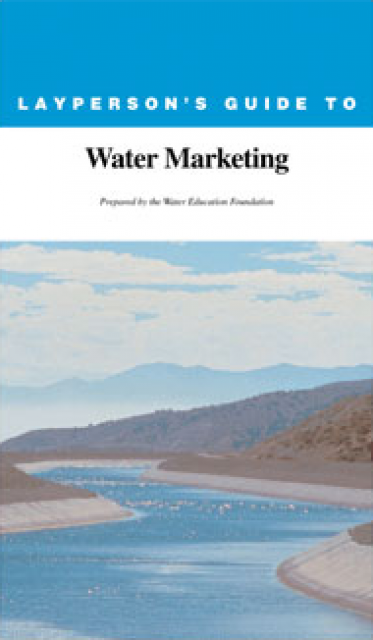 The 20-page Layperson’s Guide to Water Marketing provides background information on water rights, types of transfers and critical policy issues surrounding this topic. First published in 1996, the 2000 version offers expanded information on groundwater banking and conjunctive use … Colorado River transfers, CALFED’s Water Transfer Program and the role of private companies in California’s developing water market. Order in bulk (25 or more copies of the same guide) for a reduced fee. Contact the Foundation, 916-444-6240, for details. 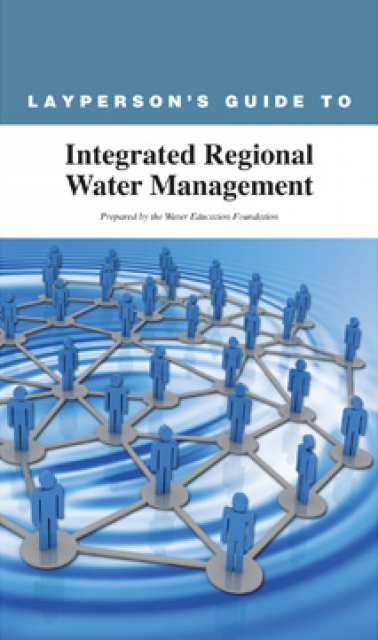 The 24-page Layperson’s Guide to Integrated Regional Water Management (IRWM) is an in-depth, easy-to-understand publication that provides background information on the principles of IRWM, its funding history and how it differs from the traditional water management approach. The Colorado River provides water to more than 35 million people and 4 million acres of farmland in a region encompassing some 246,000 square miles in the southwestern United States. 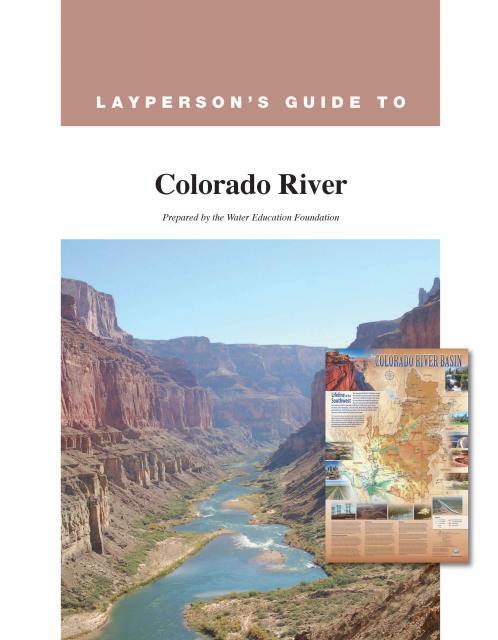 The 32-page Layperson’s Guide to the Colorado River covers the history of the river’s development; negotiations over division of its water; the items that comprise the Law of the River; and a chronology of significant Colorado River events. The Yuba Accord is a landmark agreement that balances the interests of environmental groups, agriculture, water agencies and hydroelectric operators relying on water from the Yuba River. A tributary of the Feather River, the Yuba is located north of Sacramento. 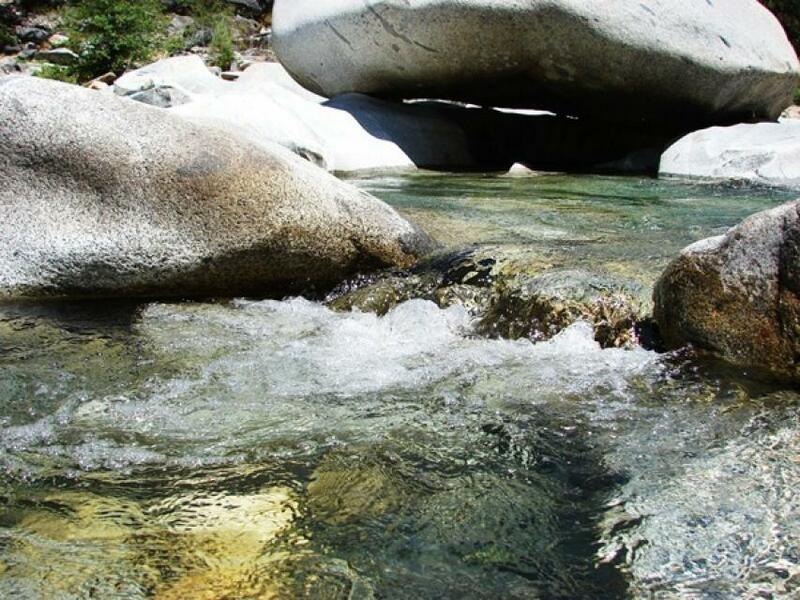 Pieced together after two decades of lawsuits, the Yuba Accord allows for fresh water flows to support native fish while also providing water for hydropower, transfers and irrigation. The Accord took effect in 2008 after two years as a pilot project. Most exchanges involve a transfer of the resource itself, not a transfer of the right to use the water. Reallocating the available water on a supply-and-demand basis is viewed by proponents as the best financial, political and environmental means of accommodating an increase in population. As part of the historic Colorado River Delta, the Salton Sea regularly filled and dried for thousands of years due to its elevation of 232 feet below sea level. The most recent version of the Salton Sea was formed in 1905 when the Colorado River broke through a series of dikes and flooded the seabed for two years, creating California’s largest inland body of water. The Salton Sea, which is saltier than the Pacific Ocean, includes 130 miles of shoreline and is larger than Lake Tahoe. 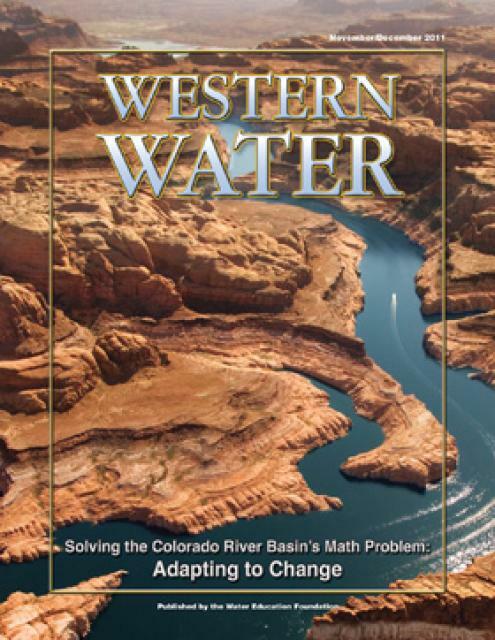 This printed issue of Western Water examines the Colorado River Basin Water Supply and Demand Study and what its finding might mean for the future of the lifeblood of the Southwest. 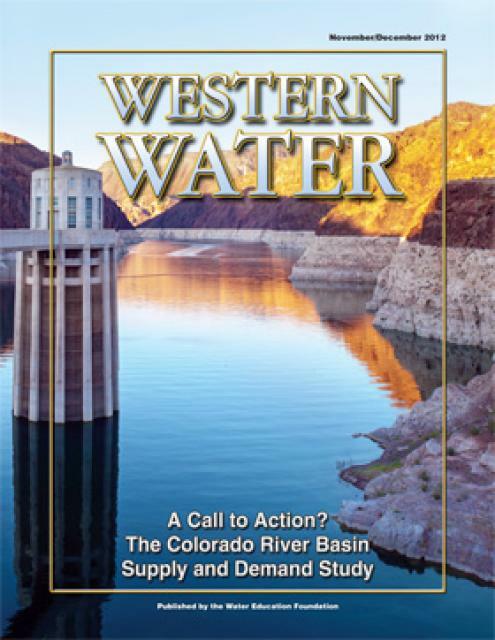 This printed issue of Western Water explores the historic nature of some of the key agreements in recent years, future challenges, and what leading state representatives identify as potential “worst-case scenarios.” Much of the content for this issue of Western Water came from the in-depth panel discussions at the Colorado River Symposium. The Foundation will publish the full proceedings of the Symposium in 2012. 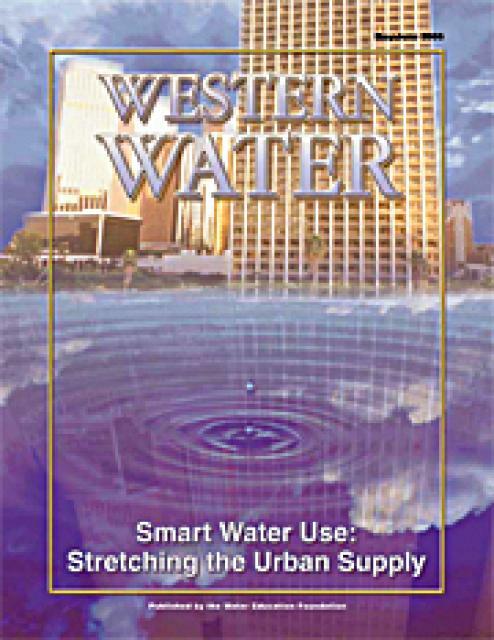 This issue of Western Water examines the continuing practice of smart water use in the urban sector and its many facets, from improved consumer appliances to improved agency planning to the improvements in water recycling and desalination. Many in the water community say conserving water is not merely a response to drought conditions, but a permanent ethic in an era in which every drop of water is a valuable commodity not to be wasted. This issue updates progress on crafting and implementing California’s 4.4 plan to reduce its use of Colorado River water by 800,000 acre-feet. The state has used as much as 5.2 million acre-feet of Colorado River water annually, but under pressure from Interior Secretary Bruce Babbitt and the other six states that share this resource, California’s Colorado River parties have been trying to close the gap between demand and supply.